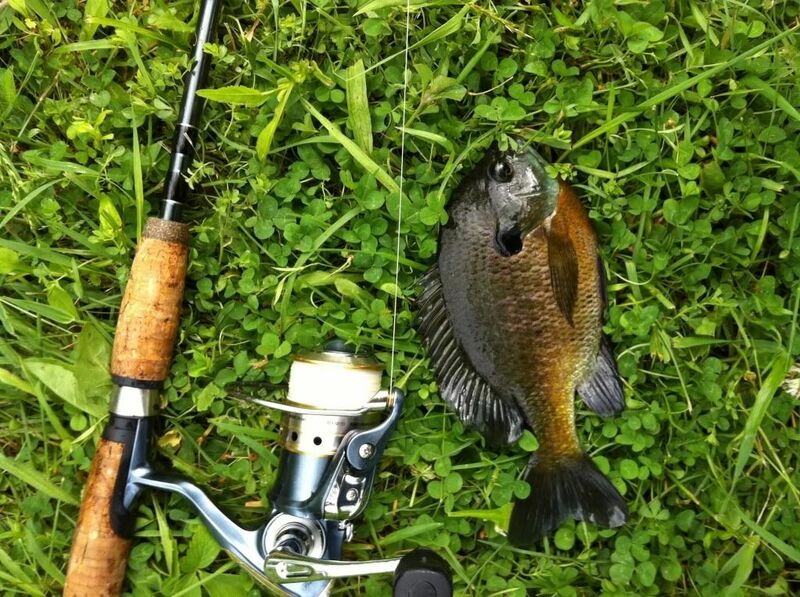 From Franklinville: Two big Bluegills that hit Yamamoto Senko worms. I thought they were bass, they hit with such authority. Wanted to use the fly rod here, but time was short and the clouds were threatening yet again. Oh well...next time. So, that was Friday evening, and we were also able to help Gary move a trailer even in the rain. Saturday brought more of the same, on and off rain, light storms, and lots of wind. A bit difficult to do much fishing anywhere. We went to Chautauqua Lake in the morning to throw big blade baits for muskies, but had nothing but rain in the two hours we were there. Nothing was active, not even the frogs. So, we went back to the house and after a bit of a nap, I awoke to find the rain had stopped and the skies were cloudy. Took advantage of this lull and went around to the creek. It was runnig fast and the water level was high, and my time was short. I figured the best way I was going to catch any trout was with a slip bobber. Worked like a charm. 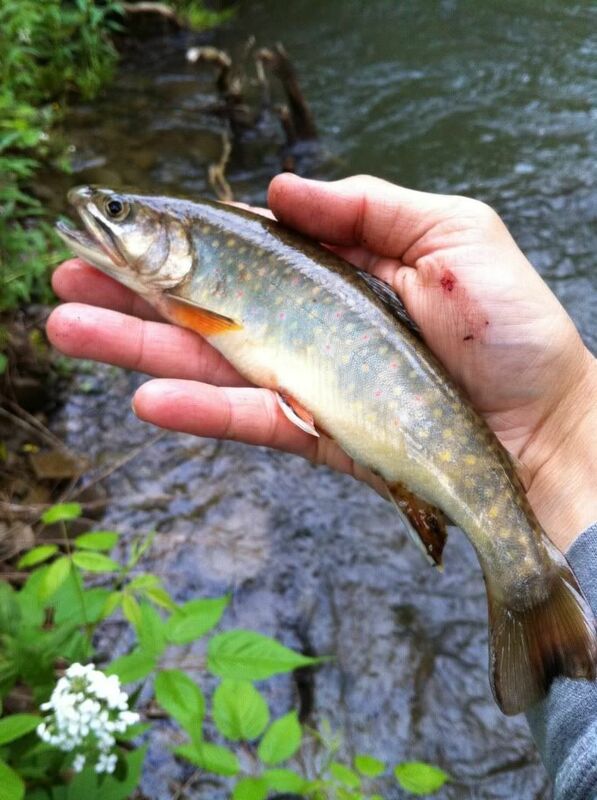 This pretty little male Brookie took the redworm I was using on light tackle setup, and he hit so lightly that I didn't even feel it. Only way I knew I had a hit was because the slip bobber went under. Not a really big one, but man, he was very photogenic! Got 3 nice pics of him before I released him to fight again! What do you guys think? Very pretty fish of you ask me! Even has hints of his parr markings still. So, all in all this weekend was kind of a bust fishing-wise, but I try not to look at that way. At least I caught a couple, and lets face it. A bad day fishing out in the wild is STILL better than a good day at work in the loud city! I was at least happy to be out there and away from the usual city bustle. This Wednesday, I hope for a better time on the fishing front. After work Wednesday, my brother and I are goin out to Great Valley to fish in the Sprague Lakes for a bit of a warmup, and then it's off to Rushford Lake to go after nighttime walleyes! Sorry to hear the wind has spoil your fishing. You did catch some fish and that is good. Better than getting skunked! Anyway a day outside is always better than staying inside. You had some fun and this is very important. Thanks for sharing your fishing day with us. Much appreciated! Fly casting in a howling wind is not only difficult but it can be dangerous. I'd like to have a dollar for every flyfisherman who has hooked himself in the wind and I will be a rich man! It is exceedingly difficult to cast in a high wind and the danger of hooking oneself, or his fishing companion is great. The fly and the flyline will be travelling through the air at high speed and it is very difficult to control the cast in the wind. Most savvy flyfisherman will do this to prevent hooking himself casting in the wind. If you are a right handed caster you would want the wind to come from your left hand side as the flyline and hook will be kept away from your head and body. The little fly is travelling a tremendous speed through the air and it can penetrate scalps and earlobes easily. This is even more true with a large/heavy fly with a large hook. I know you cast left handed so the reserve of the above will work for you. The Yellowstone River in Montana is known not only for its big trophy trout, is is also one of the windiest big river there. Yes, I have hooked myself a few times and you get smart after that excursion to the hospital to remove the fly from your back! 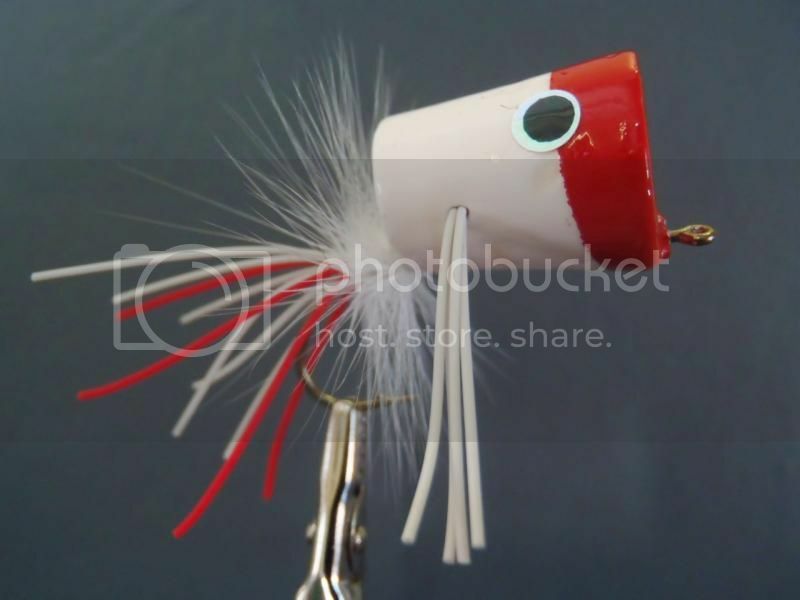 I have found some pictures of bass/panfish popper for you. You should pick up some of those at your local sporting goods store. They will be very useful for catching surface feeding bass and sunfish when the conditions are just right. It is quite simple to work this little popper. You would want to make a cast to a likely looking spot. For bass you would want to cast it to the edge of a weed bed, or close to some kind of structure like sunken logs and trees. After you made the cast you let it sit still for half a minute or so, then you raise your rod tip and make the popper move forward with a pop and gurgle. Then you let it sit still for a bit and repeat the action. If a sunfish or a bass is near by he will charge up from the depths and smash that little popper. It is a lot of fun, and quite a sight to see this. This is a visual form of fishing that is very exciting as you can see the action of the fish and the strike. Sometimes an hungry Pike will smash the little popper too but they will be seldom caught because of their sharp teeth and strength. 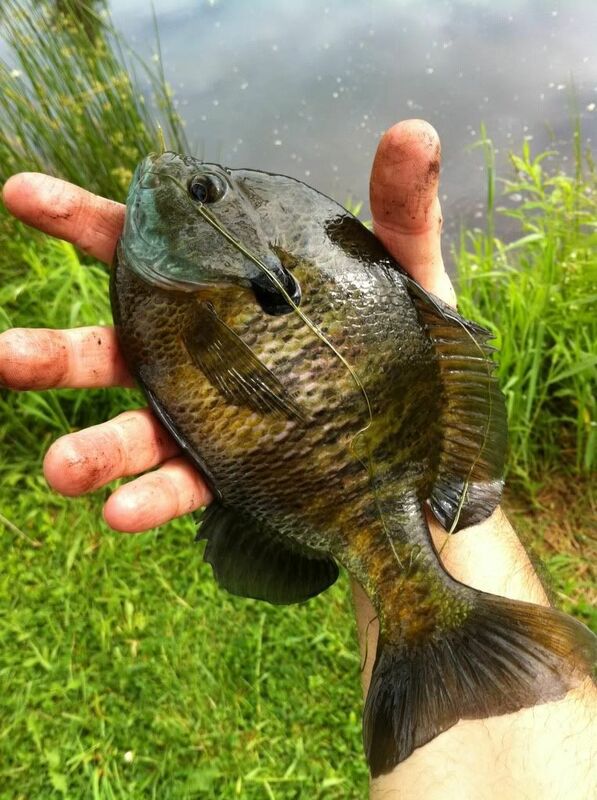 Very exciting way to fish for these fish in your friend's ponds! Once you have had some success with this you will be hooked for life! 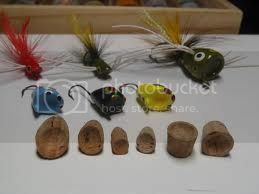 Below are some pictures of the bass/panfish poppers. I like to use deer hair poppers myself as I can make them a little bigger and they won't weight too much and will be easier to cast with a flyrod. That will come later after you learned to tie some flies! I spend a whole day out in Franklinville at Gary's. The surrounding areas around the ponds are much more open. It's kind of funny actually. I'm learning how to fly fish and my brother is learning how to use a baitcaster LOL! He's a little behind...since I'm already very proficient with a baitcaster and various casts. I've shown him a few things so far. 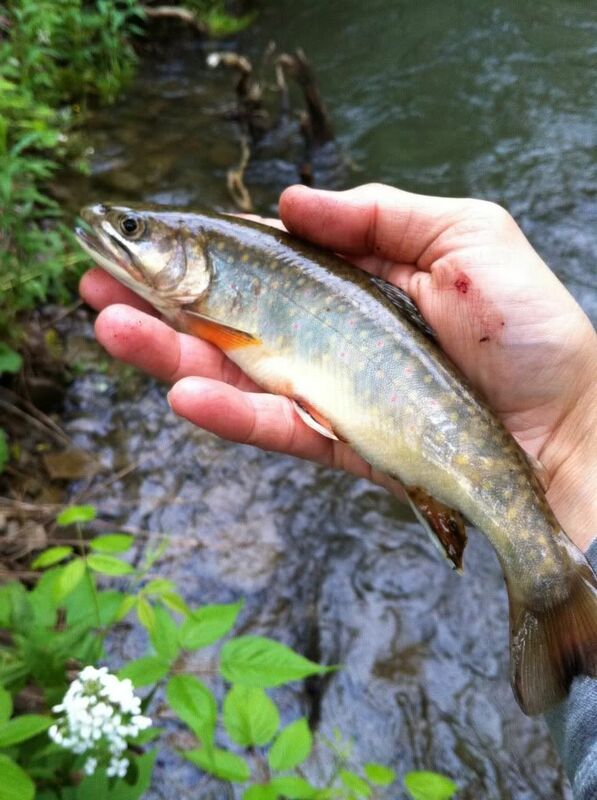 Anyway, I'm still surprised at just how good those pics of the Brook Trout came out. I do not know which is the best of the three! Very photogenic fish! Cooperated nicely and was only out of the water for maybe a minute or two, just enough time to remove the hook and snap pics! Let him go to grow and reproduce. 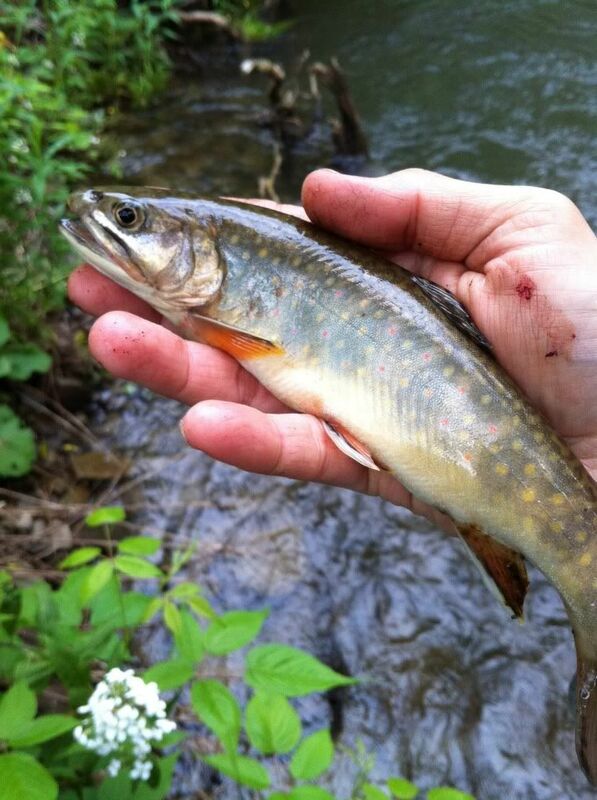 That's exactly how I like it, especially in our little creek! Very nice pictures indeed. Did you take them with your iPhone or a camera? To practice casting find a place with enough room in front and back as the backcast will be as long as the forward cast. 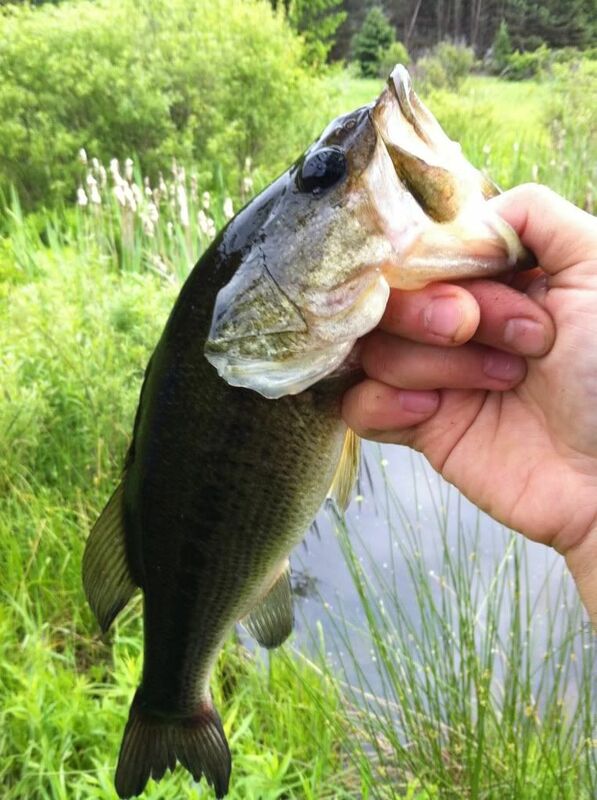 That is why I suggested your friend's bass pond for your first flyrod outing. It gets really tricky in a stream situation when you have a lot of trees and brush around the water and this will require different casting technique. Lots to learn and experiment with. Here is a picture of a good looking hair frog. 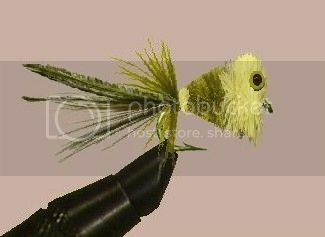 I tied this popper using the RWFF flytying tool and it is very similar to the ones I use in real life. Stacking deer on a hook requires quite a bit of practice but it is lots of fun to do after your learned how to do it. After stacking the deer hair you can give it a haircut and shape it into anything that you want with a pair of scissors. I also soak my hair frog in a silicon solution (floatant in flyfishing lingo) to prevent it from absorbing water and become heavy. It will always float on top of the water after treating it with silicon. You will have lots fun experimenting with your new toy. Can't wait for the first caught picture with your new flyrod.